Her special Pele the Fire Goddess statue is part of a set inspired by the elements. Alice also creates a new set of “Flower Faeries” that are inspired by a signature flower at that year’s Show. This year is the orchid—how lovely! We love how her faeries capture the dynamic energy of dancing within the static medium of sculpture. Check out all of her curly-haired garden sculptures at the Copper Curls website. Last week I mentioned some Marketplace vendors I’m especially excited about. Turns out that’s just the tip of the iceberg! Here are three more great vendors, which is still only a fraction of the complete list. 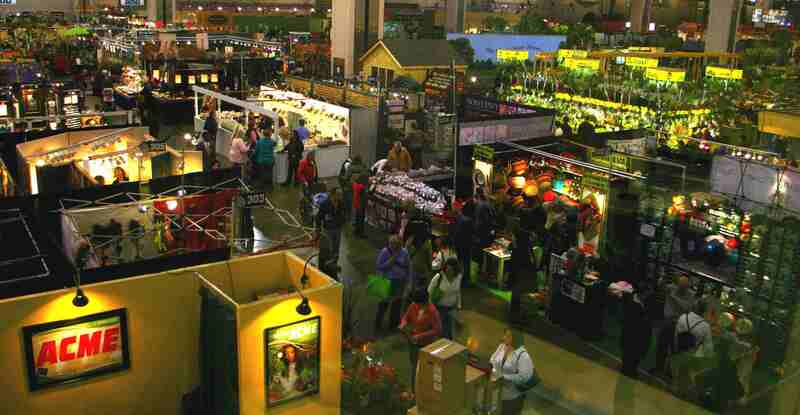 By the way, shopping at this year’s Show will be easier than ever, with shorter aisles and a more visitor-friendly layout. After you go to the Show, let us know which booths were your favorites and what fabulous things you found! For more than 50 years, Roberta’s has been a purveyor of difficult-to-find, yet easy-to-grow plants, often featured on QVC. Their Flower Show offerings will include Hawaiian plumeria in a variety of colors including pink, red, yellow, and white, each with its own luscious fragrance. Roberta’s fertilizer and pots will enable you to bring a touch of the tropics home! Floral artists Julie Ann and Jim Gibson preserve and press fresh flowers and leaves at their peak of beauty, then combine them into botanical masterpieces that can enjoyed for years to come. At their studio in the San Tan Mountains of Queen Creek, Arizona, the couple’s love of flowers and award-winning artistic sensibilities come together as they paint with blossoms and foliage, then display the everlasting gardens behind protective mats and frames. You can’t get any more local, sustainable, or fresh than by growing mushrooms at home. Each Back to the Roots kit includes everything you need to grow up to 1.5 pounds of gourmet oyster mushrooms in as few as 10 days, right from the box. Founders Alejandro Velez and Nikhil Arora created the system that uses recycled coffee grounds as the growing medium, diverting and reusing one million pounds of coffee grounds from Peet’s Coffee & Tea during 2011. Kits can be stored unused for months, providing you with a year-round supply of fungal goodness. More than 180 vendors will showcase their wares at this year’s Show, promising to make the shopping part of your visit an event in itself. Here are some highlights of what you can expect to find; three vendors whose products reflect the wide range of Marketplace offerings. Liz creates an exciting line of ceramic vases, lamps, pitchers, planters, urns, sinks, and more. Known for her sense of color, her palettes range from the soft, muted “Frilly” line, to the edgy hues of “Urban Chic” and the bright rainbow shades of “Striped Rim.”A graduate of the Royal College of Art in London, Liz now works out of her studio in Philadelphia and her pieces can be found in stores nationwide. Michelle Inciarrano and Katy Maslow’s enchanting miniature gardens have been seen in a variety national magazines including Garden Design, Every Day with Rachel Ray, Real Simple, and The New York Times. 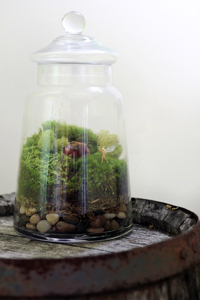 Planted in antique, vintage, and new glass containers, each layered environment contains a mossy scene with miniature figurines–from an idyllic, pastoral scene of grazing cows to magical fairies in a woodland glade. Ready-made terrariums, do-it-yourself kits, and gift certificates are available. Here are even more great Marketplace vendors. We wish we could profile them all; there’s so much cool stuff to be had! Bud Scheffel, owner and operator of Earth Saver Wind Sculpture, is an artist based out of Shokan, NY, specializing in one-of-a-kind wind sculptures, suncatchers, and mobiles. 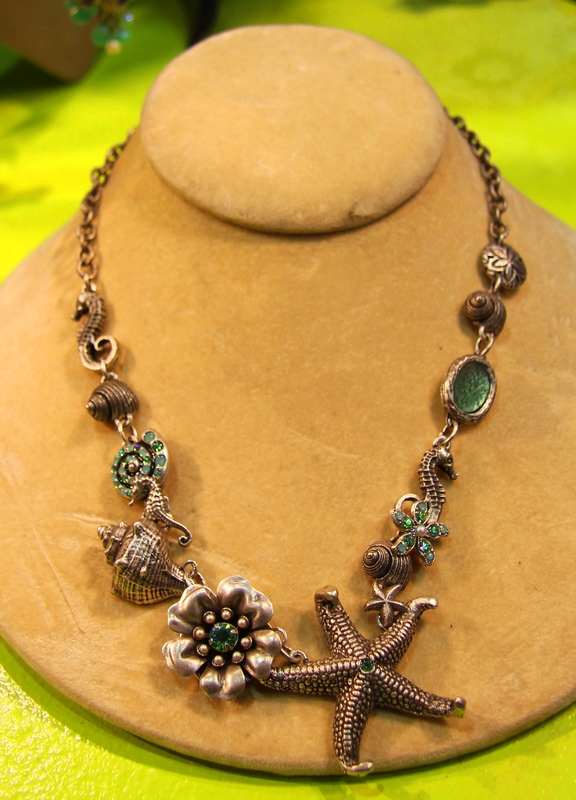 Inspired by nature and his extensive international travel (including Paris, Milan, Tokyo, and Japan! ), a majority of Bud’s pieces are reclaimed or recycled materials. With a background in math, physics, and advertising, Bud says that his comprehension of these fields as well as design helps him to create his sculptures. 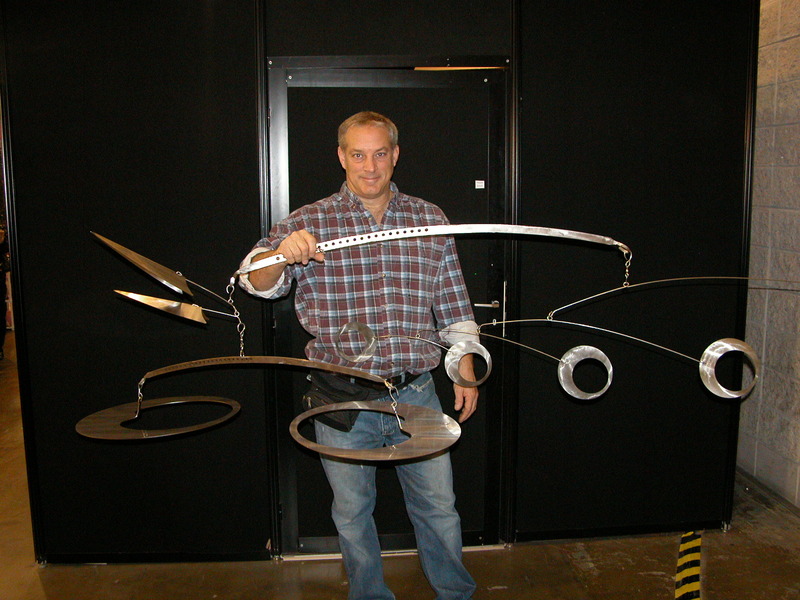 You can find Earth Saver Wind Sculpture in booth 701 at the Show, or through his website. Jerry Fritz of Linden Hill Gardens calls himself a landscape craftsman; with his extensive fan base, appearance on the Martha Stewart Show, and first-place prize at the Flower Show, we have to agree! 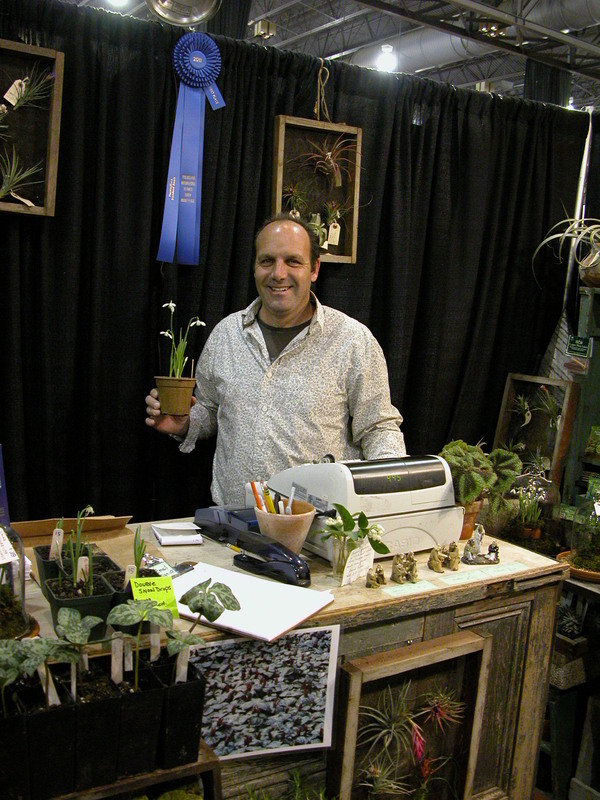 While Jerry featured an exhibit at the Show in 2000, this is his first year as a Marketplace vendor. With extensive knowledge of gardening and landscaping, Jerry lectures and is the proprietor of Jerry Fritz Garden Design Inc. Pictured here with his prized snow drops, Jerry can’t wait to come back next year! Stop by booth 229 to pick up your snow drop, or head over to the Linden Hill Gardens website. 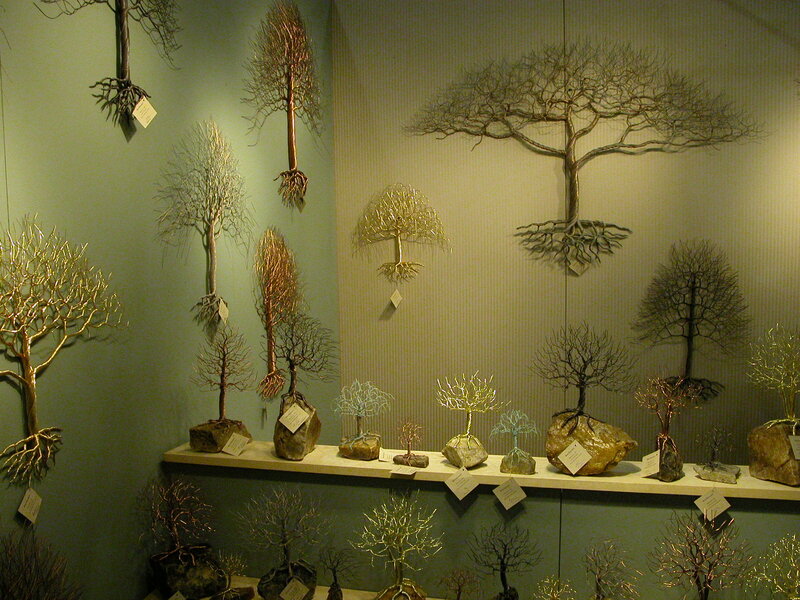 Trees Co. is celebrating their 25th year at the Flower Show, featuring the unique metal works of self-taught artist, Rob Hagarty. Working with t wo materials, copper clad steel wire and silver wire with gold enamel plating, Rob skillfully crafts each piece by hand in a variety of tree shapes and sizes, from 18 inches all the way to 60 inches! The center of the photographed showcases Rob’s prized African Acacia tree sculpture. Inspired by a photo his daughter took at an African safari, Rob duplicated the tree right down to the limbs chewed off by giraffes! You’ll find Trees Co. in booth 307, but after the Show, check out their website. 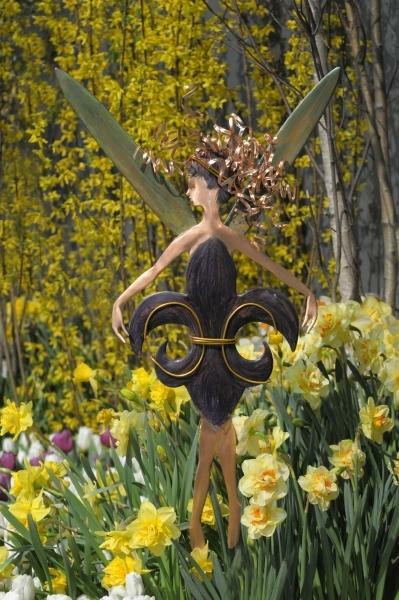 The major floral and landscape designers aren’t the only ones getting ready for “Springtime in Paris.” We just heard from Markeplace vendor Alice Calhoun of Copper Curls® Sculpture who is hard at work on all her new designs for the 2011 Philadelphai International Flower Show. Calhoun already has two new flower faerie designs and may have one or two more. The museum of medieval art in Paris, Musee de Cluny, is serving a source of inspiration. During her trip this holiday season, she is hoping to find a painting that will produce something as special as Botticelli’s Primavera did for the 2009 Flower Show. Many more surprises to unveil! 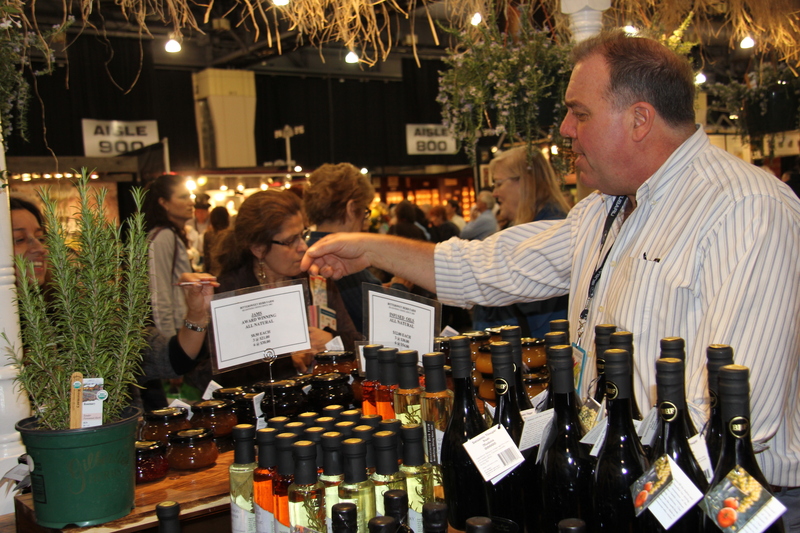 To learn more about shopping at the Show and marketplace opportunities, click here. 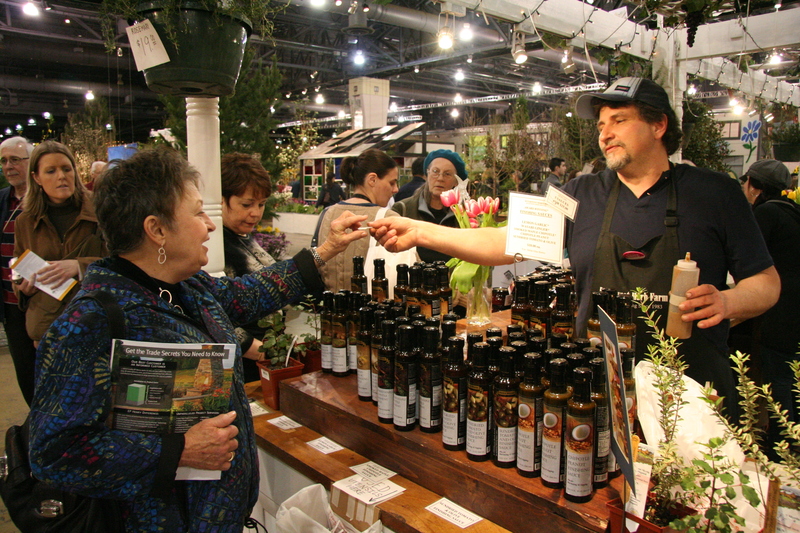 The Flower Show Marketplace is a key destination for most Show-goers, plus PHS members get 10-20% off at select vendors. There are over 150 vendors selling garden furniture, one-of-a-kind plant containers, hand-crafted jewelry, specialty foods, cut flowers, unique plants and garden tools, and so much more. 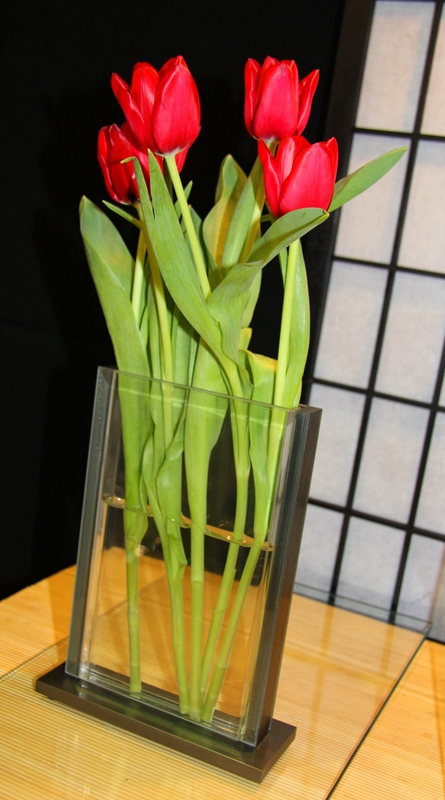 The Shoppe is the official Flower Show store with commemorative 2010 Flower Show clothes and gifts. Plus one of a kind garden gadgets and specialty items. Members save every day at the Shoppe – show your card. New this year- limited edition Boehm American Porcelain pieces created exclusivly for the 2010 Show. NEW this year is the World Bazaar, an incredible, international shops from around the world. Celebrate PASSPORT TO THE WORLD with an international souvenir. Looking to relive the incredible experience of the 2010 Show? Pick up your copy of the official video at the PHS Shoppe in Hall A. After the Show, order by mail. Makes a great gift! 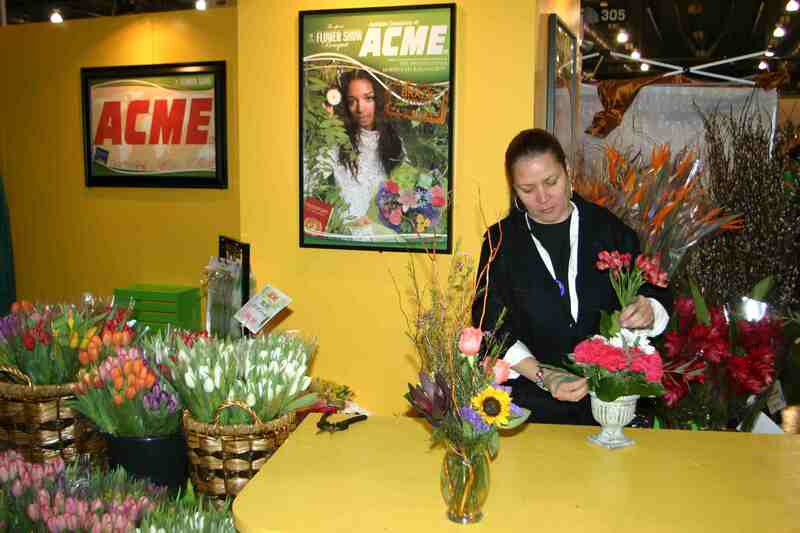 You can get your Flower tickets and flower bouquets at Acme Markets, but if you go to their booth at the Flower Show (in the Marketplace), you can buy flowers and watch free flower-arranging demonstrations, too. Why do I love the Flower Show? Because of people like Vincent and Josephine Lu. For the past 51 years (!!!) they have had a booth at the Flower Show’s Marketplace. Called “The Oriental House,” the Lu family sells novelties, miniatures, figurines, and bonsai. The good news/bad news is that this is the Lu’s last Show. While their presence will no doubt be missed, I can’t think of anyone more worthy of a restful retirement than this New York-based family. 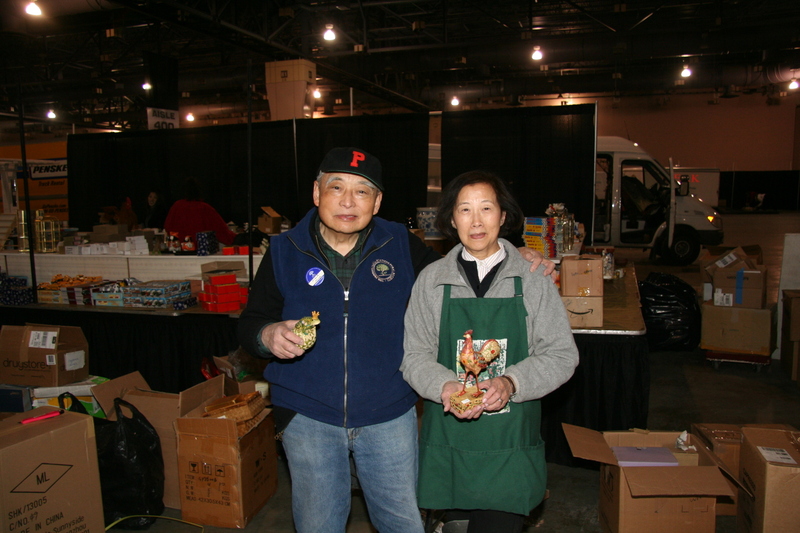 A huge, heartfelt thanks to Vincent, Josephine and their daughter Irene for all their years of Flower Show support! Exciting attractions for students at this year’s Flower Show. 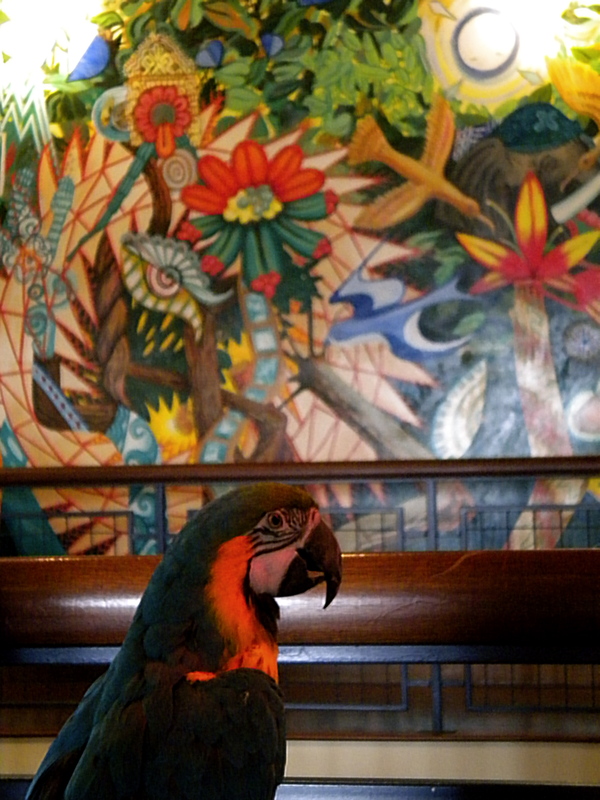 The Philadelphia Zoo will be sending colorful representatives to do demos at the Flower Show. 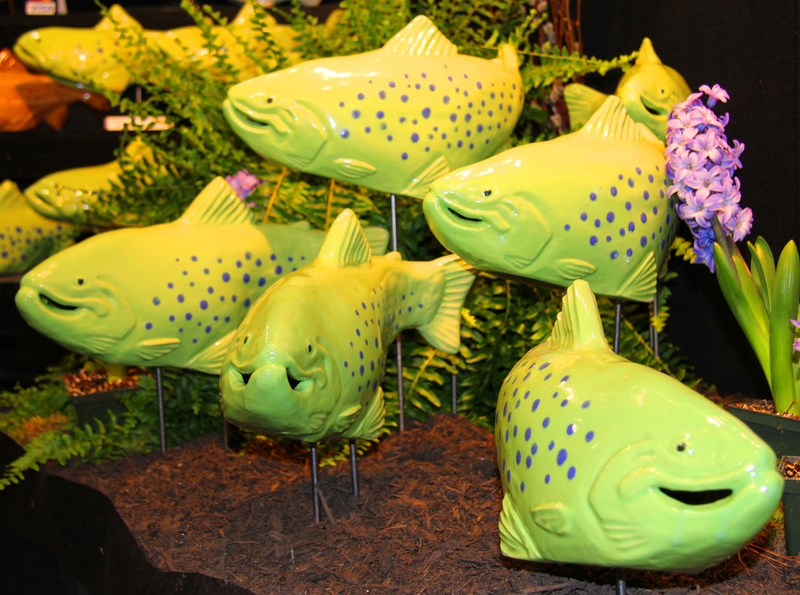 The Philadelphia International Flower Show (February 28-March 7) is a great study break for area college students. In keeping with the “Passport to the World” theme there will be daily musical performances by the vibrant Brazilian troupe, Minas, who recently performed at World Café Live in University City.